From the Retro Humor collection by Vandor. 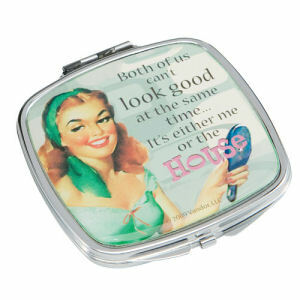 Retro Humor by Ephemera Me or House Metal Compact Mirror. This Item is in stock and ready to ship. You should not postpone your purchase and miss out on adding Retro Humor by Ephemera Me or House Metal Compact Mirror to your Retro Humor collection! From the Retro Humor collection by Vandor. Me or House Metal Compact Mirror. Epoxy coated image on high quality stainless iron dual compact has a regular mirror on one side and a 2X magnification mirror on the other.